Having an indoor water fountain added in your workplace or home will improve décor while creating a tranquil, more relaxed environment. 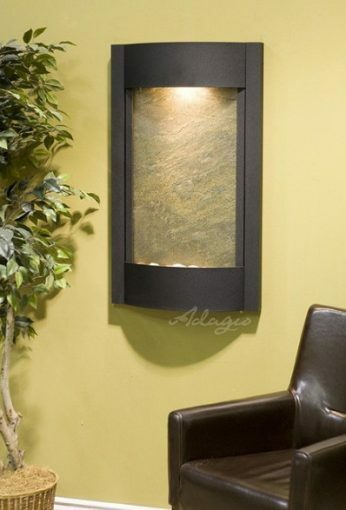 The sounds the water makes as it trickles down the feature glass surface plus its artistic, rather brilliant appearance creates a stunning aura, making this a great decorative accessory to have in practically any indoor area or room. However, like most decorative accessories, indoor water fountains will still require maintenance from time to time to maintain their pristine condition. While tap water probably won’t cause any damage to indoor water fountains, it is still not the best option to use. “Why,” you ask? Well, the reason why you should avoid using water from a tap in your fountain is that it often contains different chemicals, minerals and various other pollutants that could stain your fountain. And while this is something that won’t happen overnight, using water from your tap will, over time (from several months to a couple of years), lead to the fountain discoloring. Instead of using tap water to fill your fountain, consider using distilled water. Distilled water has undergone a distillation process which leaves it pure and free of any adulterants or elements. That means that distilled water contains no contaminants or anything that would contaminate your fountain. And while it costs more than average tap water, this is a very small price to pay to ensure that your fountain remains in pristine conditions. Most people turn their heads at the thought of adding a little vinegar to indoor water fountains since they think it’ll give the water an unpleasant smell. It is true, vinegar possesses a rather pungent smell, but it quickly dissipates and the vinegar works on the fountain, leaving it clean and fresh. To quickly freshen and clean your water fountain, add 2 cups of filtered white apple cider vinegar, which exhibits antiseptic, antiviral, and antibacterial properties, and kills germs on contact. According to Indoor Fountain Pros, the great thing about it is that it is an all-natural cleaner, which means you do not have to use any harsh chemicals to clean your fountain. Even if you pour some vinegar in your water fountain from time to time, you still should consider getting into the habit of cleaning the fountain’s pump every once in a while. With continued use, you should expect a layer of grime to build up over the pump over time, something that could lead to the pump jamming or breaking down if not sorted in good time. However, the good thing is that this is a problem that can be easily fixed by cleaning out the pump. To do this, turn off your pump and follow the instructions provided on how to properly clean the pump and its different parts.